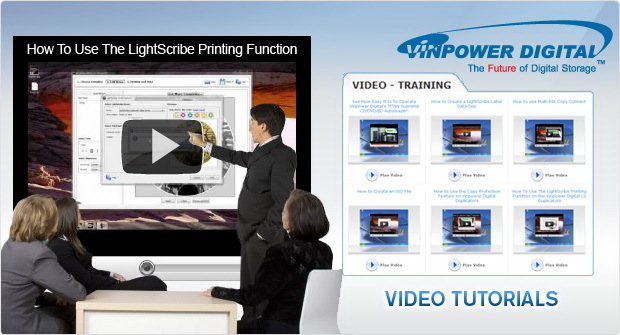 Did you know that Vinpower offers multiple instructional videos on our website? Often times our tech support fields calls asking questions about how to use this product or feature which can be time consuming and difficult to instruct over the phone. It’s because of this that we have developed a number of instructional videos that provide both video and audio instructions on how to perform certain tasks such as; How to Create a LightScribe Label, How to Operate Vinpower’s TITAN Supreme, How To Use the Multi-File Copy Connect, and more. This has been a tremendous asset to both end users inquiring about the products, as well as our support team, freeing up their time to focus on customers with issues requiring more focused attention. So, whether you’re using Vinpower products and are wishing to gain a better understanding on how they work or if you sell Vinpower products and want to make certain your customers are aware of how to use the products, we most likely have a video that will benefit you. You can check our website through the below link or find any number of our videos on YouTube. At Vinpower, we care about the whole customer experience and not just a single sale. So, when you’re looking to purchase products that will last and will continue to be supported, Vinpower Digital is the name you can rely upon. 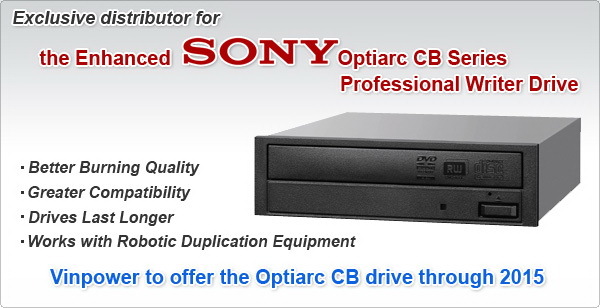 Vinpower will supply the enhanced Sony Optiarc Duplication CB model writer drive for at least the next 3 years. Vinpower has worked closely with Sony Optiarc to develop the enhanced duplication CB drive series, which include many exceptional features such as DVD+R DL Overburn, Enhanced Recording Stabilization Control, Tray Extension for autoloaders, Secure Media Speed Stability, and so much more. The CB drive has become the drive of choice for those that need these specialized features, as well as those that want to ensure a superior burned product with fewer failures, and a longer life span compared to other traditional DVD drives. Recently, it was announced that Sony Optiarc was shutting down and will no longer manufacturer or supply any ODD recording drives after December 31, 2012. This was a devastating blow to the duplication market, which had come to rely on these drives for their platform and duplication needs. Fortunately, because of the close relationship Vinpower developed with Sony, Vinpower will be able to continue supplying the enhanced duplication version CB drives for at least the next 3 years from January 2013 through 2015. So if you have been using the Sony drive and felt uncertain about what to use next or if you are looking for a better writer drive option, contact Vinpower today to discuss the opportunities to secure the CB drive. Vinpower Digital’s Hard Drive (HDD) Duplicator has proven to be an excellent IT office accessory. Typically, when an office worker upgrades their computer or a new hire is assigned a new computer, the most crucial element of that process is to ensure that the employee has all of the proper software and files on the computer’s hard drive so that they donâ€™t miss a beat.It seems simple enough, just load the files from one HDD to the other, but in practice it is a lot more involved than that. 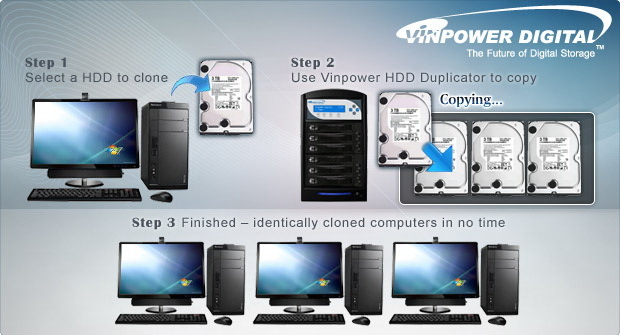 Trying to load all of the programs and files from an existing HDD to the new one could take far too long and is a tedious task when being accomplished manually, but with a Vinpower HDD Duplicator, itâ€™s incredibly easy and fast to use. In the smart copy mode, the HDD duplicator can transfer content at 150 mb/sec, all found files from the original HDD to another HDD, even if the HDD to be copied onto is considerably larger than the master version. Think about the savings in time and expenses when using this simple yet powerful HDD Duplicator at your office.